The California wildfire video was taken on the famously congested Interstate 405, by a Twitter user on his morning commute. 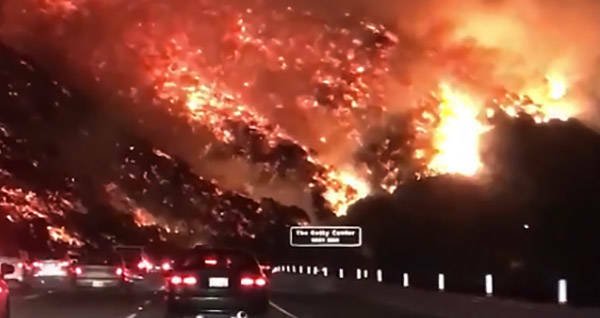 On his commute to work Wednesday morning, Twitter user A. Mutzavaugh CMT captured a surreal video of a Los Angeles hillside, off Interstate 405, entirely engulfed in flames. In the video, dozens of unconcerned commuters drive down the highway as the California wildfire rages on just yards away. For the past week, ferocious wildfires have been tearing across Southern California. The largest one is roughly the size of Orlando and, as of Wednesday morning, has already wiped out 65,000 acres. The video was taken on the famously congested Interstate 405, a few miles from the Getty Center. Portions of the highway have since been shut down due to the fires. So far, roughly 27,000 people have been forced to evacuate, and nearly 12,000 structures are under threat of burning down. Over 1,000 firefighters have been dispatched to attempt to control the blaze, though many have been unable to enter the fires due to extreme heat. So far, there have been no fatalities from the fire, though three firefighters were injured while working. The fires resulted from a severe drought, which California has been suffering from for over a year. Last winter, the state finally got the rain it needed, though the rain ended up being the downfall. The rain encouraged vegetation to grow, but once the summer came, bringing with it an excessive dry heat, the vegetation dried out and became fuel for the now-raging fires. Now that you’ve read about the California wildfire, read about Centralia, Pennsylvania, the town that’s been on fire for over 50 years. Then, check out these potos of the deadly Cocoanut Grove fire.